Hammer Films dominated horror in the 1960s, with their stylish Gothic approach and stable of charismatic actors. Their Dracula and Frankenstein franchises were particularly lucrative, and while it would be stretching things to say that they could do no wrong during this period, it’s reasonable to expect a certain high degree of quality. 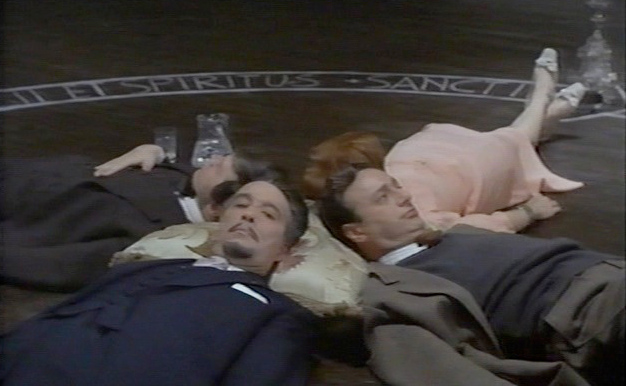 The stakes get raised when considering the creative team behind The Devil Rides Out . The opening titles are a wash of swirling smoke and green symbols of the occult. Terence Fisher had directed several of Hammer’s hits, including The Curse of Frankenstein , Horror of Dracula and The Hound of the Baskervilles . Richard Matheson had helped turn his own book I Am Legend into the famed movie The Last Man on Earth , starring Vincent Price. He’d written the screenplays for Roger Corman’s Poe adaptations The Raven , The Pit and the Pendulum , and Tales of Terror . Between them, Fisher and Matheson brought an impressive resume to the table. Then there’s Dennis Wheatley, an English author whose writing influenced Ian Fleming. His first published novel, The Forbidden Territory (1933) featured the Duke de Richleau. 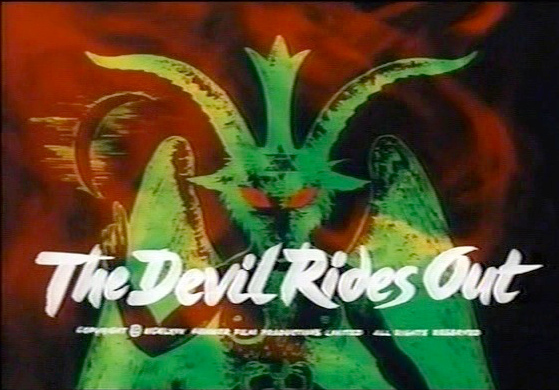 The following year saw the release of both a movie version and the second in what would be an 11 book series of the Duke’s occult adventures, The Devil Rides Out . Still a best-selling author in the 1960s, it could be assumed that Wheatley’s works would have been familiar to British audiences for this adaptation. It’s clear that Matheson relied on this familiarity. Characters have relationships that are glossed over, as though unnecessary to explain. The Duke just happens to know everything about the occult, and his knowledge is explained with a terse comment about his studies. It feels like several scenes are missing, and in fact there are — an entire book’s worth! The result is a mixed bag. On the one hand, it’s kind of realistic that we don’t get a lot of context. People are busy fighting Satan and don’t have the time to re-establish their relationships. Yet it distances the viewer a bit as well. There’s a tight central group of characters, and we’re on the outside. It’s frankly a little off-putting. 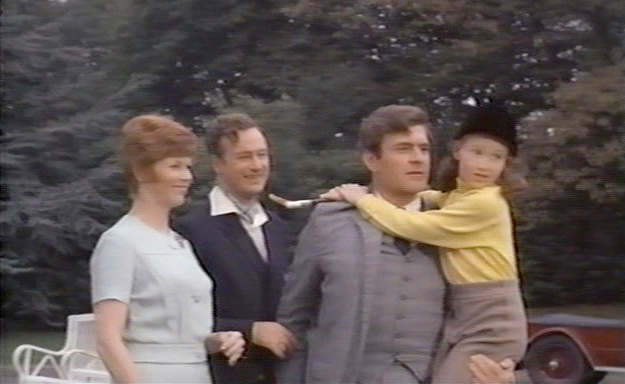 The Eatons, with young Peggy hanging on Uncle Rex. They also call de Richleau uncle, so who knows if they’re even actually related to anybody? 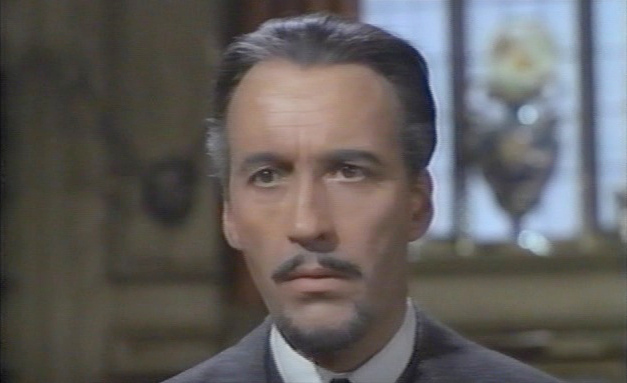 Fortunately, the film stars Christopher Lee in the crucial role, here very slightly renamed as Duc de Richleau. Lee’s authoritative manner makes de Richleau seem more than capable of besting Lucifer at anything from magic to snooker, which somewhat mitigates the absence of back story. On the downside, he frequently leaves to conduct research, and nobody he knows can follow simple instructions. 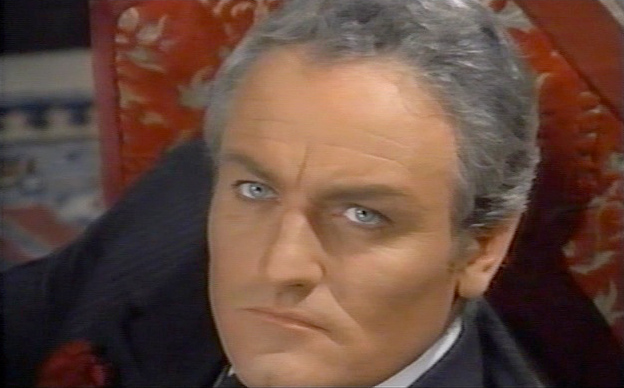 This allows the dastardly Mocata (played by the deliciously fiendish Charles Gray) to do pretty much anything he wants. What Mocata wants is to add two members to his coven to bring their number up to the requisite 13. He’s accidentally selected Simon Aron (Patrick Mower), who de Richleau and his close friend Rex Van Ryn (Leon Greene) have sworn to watch over. The other recruit turns out to be the fetching Tanith Carlisle (Nike Arrighi), with whom Van Ryn falls madly in love. Aron and Carlisle’s minds are already under Mocata’s control, so there’s nothing for it but that de Richleau and Mocata battle for their souls. It’s all very much like a serial, with the villains and heroes dashing after each other fruitlessly until the climax. So how does a giant spider figure into this movie? Simon is placed under the protection of de Richleau and the Eatons (a nice couple, related to somebody) inside of a magic circle. If they can prevent Mocata from claiming Simon overnight, he’ll be safe. The first gambit Mocata tries is to send a giant tarantula to prowl the edge of the circle. When that somehow fails to make anyone leave the protection of the circle, young Peggy Eaton enters the room for the spider to menace. Duc de Richleau was renowned for his creative party games. The approach chosen was a mixture of filming a tarantula on a miniature set and matting it in when it needed to be seen with the actors. This is a difficult trick for color film, and the complicating factors of the lighting in the room do not work in the effect’s favor. Nonetheless, it’s largely effective. In most of the sequences, it works well. The worst lighting problems occur when interacting with Peggy, when suddenly the tarantula is too bright. It could have come off as a game attempt if not for the inclusion of footage of the spider “rearing”. While tarantulas will rear up, it’s generally because they feel threatened. This one seems to be merely testing the glass wall in front of it. Much like the ants climbing into the air in Empire of the Ants , it re-engages disbelief with a quickness. In Hell, spider squishes you! Also quick is Mocata’s escalation of attacks, but that’s getting into spoiler territory. Let’s just say he jumps straight from “dare” to “triple-dog dare” in direct violation of the Queensbury rules. He’s sort of a jerk that way. It’s a pretty neat movie. I understand why many people consider it to be one of Hammer’s best. Lee and Gray, though sharing only a few scenes, ground the film with the power of their palpably clashing wills. Although the effects are sometimes less than spectacular, the menace they serve to reflect is stronger than in most plots about Satanism. Partly, this is due to Mocata’s mental dominance over all but de Richleau, but really it’s how far Mocata is able and prepared to go for victory. I refer to the aforementioned untoward escalation. This isn’t your garden-variety cultist. Even The Devil attends Mocata’s parties. The biggest problem I think the movie has is its ending. Without revealing anything, I’ll just say that it doesn’t make immediate sense. Just as with his script for the excellent The Legend of Hell House (based on his own novel Hell House ), Matheson underplays the critical part of the reveal. One or two more sentences from the Duc de Richleau would put it all together, but while the explanation we get is reasonable, it isn’t until ruminating over it much later that I came to accept it as more than a flimsy cheat. Maybe I’m inordinately dense, but while the conclusion makes perfect in a 1930s adventure sort of way, it just doesn’t seem direct enough for the style of story it is. The film as a whole is enjoyable, and I recommend it particularly to fans of Hammer or of old-fashioned adventure films. Just stay on your toes and repeat to yourself “it all makes sense” until you understand why. Or, you know, understand it the first time. Whatever works.